The FACE Foundation, a Dutch carbon offset company, claims on its website that its tree planting projects at Mount Elgon and Kibale national parks in Uganda are both certified by FSC. While Mount Elgon is FSC certified (despite major, ongoing land disptues), the FACE Foundation’s project at Kibale is no longer FSC certified. “The projects in Uganda meet the conditions of well managed forest and are certified according to the guidelines of Forest Stewardship Council,” states the FACE Foundation’s website. 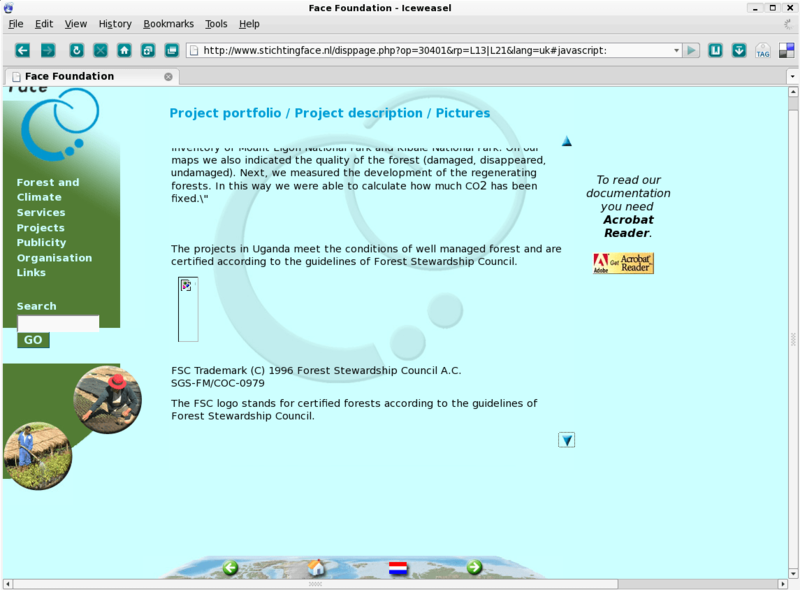 The FACE Foundation is, of course, fully aware that its project at Kibale is not FSC certified. In the information about Mount Elgon on the same webpage, there is a link to SGS’s Public Summary of its 2007 reassessment at Mount Elgon. In the information about Kibale, there is no similar link. When a certificate is suspended, the Public Summary is no longer public. No information is available on FSC’s, ASI’s or SGS’s website about why the certificate has been suspended at Kibale. FSC-watch looks forward to reporting on what action FSC takes to correct FACE Foundation’s and UWA’s misleading claims about FSC certification.